Free Wi-Fi and a can't be beat location two miles from Fort Jackson give Days Inn Columbia/Fort Jackson value for the money. Each room at the Days Inn is equipped with free Wi-Fi and free local calls. The seasonal outdoor pool is a great way to cool off after a day in the South Carolina sunshine. This hotel has 136 rooms on three floors. Parking is free. 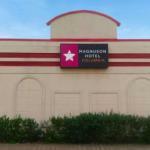 This Days Inn is located with convenient access to I-20 two miles from both main gates of Fort Jackson. The hotel is across from Columbia Place Mall where you'll find a variety of dining and shopping options. Historic downtown Columbia and the University of South Carolina are approximately eight miles from the hotel. Columbia Metro Airport is 13 miles away.